Crisp and tender with a sweet flavor. Crisp and tender with a sweet flavor. Large, deeply lobed, green leaves. Slow to bolt, non-heading. All-America Selections winner. Ready 45 days after sowing. GARDEN HINTS: Lettuce grows best in cool weather. Thinnings make delicious extra-early salads. Make successive plantings to extend period of harvest. Type Some flowers and vegetables fall into subcategories that may define how they grow (such as pole or bush), what they are used for (such as slicing tomatoes or shelling peas), flower type, or other designations that will help you select the type of a class of plant that you are looking for. Days To Maturity The average number of days from when the plant is actively growing in the garden to the expected time of harvest. Leaf Texture The typical height of this product at maturity. Sun The amount of sunlight this product needs daily in order to perform well in the garden. Full sun means 6 hours of direct sun per day; partial sun means 2-4 hours of direct sun per day; shade means little or no direct sun. Spread The width of the plant at maturity. Height The typical height of this product at maturity. 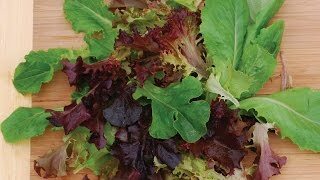 Fall is an ideal time to grow cools season lettuce favorites. Learn how to plant and grow lettuce from Burpee's expert horticulturist. Sow lettuce seeds in average soil in full sun in early spring for first crop. Sow in late summer for fall crop. Sow every two weeks to extend harvests. In late summer, sow in a protected are that stays below 75 degrees F.
Sow thinly in rows 12 inches apart and cover with ¼ inch of fine soil. Follow the spacing recommended on the seed packet for specific varieties. Firm lightly and keep evenly moist. Seedlings emerge in 7-10 days. Thin to stand 8 inches apart when seedlings are 1-2 inches tall. Keep lettuce plants well watered during dry periods to promote rapid, uninterrupted growth. Lettuce is shallow-rooted, so avoid disturbing the soil around the plants when weeding. Unless there is regular rainfall, lettuce plants must be watered deeply at least once a week and more frequently during periods of drought. Mulch with a layer of compost or clean straw to help the soil retain moisture. 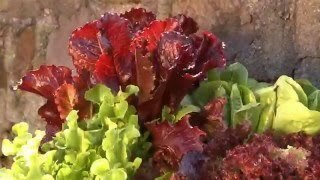 For the best quality, pick lettuce early rather than late as lettuce allowed to grow too long may be bitter and tough. Try to harvest in the morning when the leaves are crisp, sweet, and full of moisture. Harvest looseleaf types anytime the leaves are large enough to use. Harvest butterhead types when they have formed heads and the leaves are a good size. Cut the heads below the crown. On leaf types, you can just pick a few leaves at a time, if you like. Store for 5-7 days in a plastic bag in the refrigerator. Many gardeners wrap leaves in moist paper towels. Lettuce is a classic ingredient in salads. It adds crispness to sandwiches and can be used as a garnish, braised, or added to soups. Many of the looseleaf cultivars are also decorative in the garden. Lettuce, Salad Bowl is rated 4.8 out of 5 by 6. Rated 5 out of 5 by Cowgirl980 from Easy to grow, good to eat!! They are really easy to grow. I would just cut the leaf off and then theyd regrow. Rated 5 out of 5 by Sunny9 from Plenty to share, tastes good, crisp, easy to grow South Ga. climate makes this a spring & fall planting for me. But taste & ease of growing make the time, soil, & water worth it! Grew mine in a planter 8"x30"x10". I have pet dogs so didn't want to risk their tromping on plants and more importantly no body fluids from them on my plants. Planted only half a pack in garden soil & have harvested now for me and 3 other adults enough to last 3 meals from each harvest. Used liquid plant food weekly and no pesticides. Probably last harvest today. 95 degree plus temps, first bug sighting in plants, and plants getting ready to start seeding/getting leggy. Second half of seed packet will definitely be started in September or maybe later as temperature allows. Rated 4 out of 5 by CariLynn from Easy to Grow This was my first attempt to grow lettuce and I was pretty happy with the variety. It was very easy to grow. The seeds came up without any problem. It had the best taste early and became more bitter as the season progressed. I planted early in the spring and it produced into the middle of the summer before bolting. About 9 weeks ago I did a fall planting as well and they are just now ready to be harvested for the first time. I just start from the outside and remove a few leaves from each one and as it grows it keeps producing more leaves. I would have liked if the leaves were crunchier and less bitter but I suspect that those are common traits of leaf lettuce. Rated 5 out of 5 by RitaPDX from Perfect for Cuttings or as a Head I bought an envelope of seeds from Target. Sprinkled few in a raised bed. I am extremely happy with these plants. You can wait and harvest the entire head, or my preferred method is to go outside once a week, cut few leaves and use them for salads or as greens in sandwiches. A month later, sprinkle some more seeds and here they are, no need to buy big bags of pre-washed lettuce to throw away before using.